We received the most amazing book in the mail a few weeks ago. It was packed full of fun facts about everything under the sun. Seriously. There was everything from animals, history, and the ocean, to a section full of the most disgusting facts you can imagine. The book all by itself was amazing, but we decided to have even more fun with it. 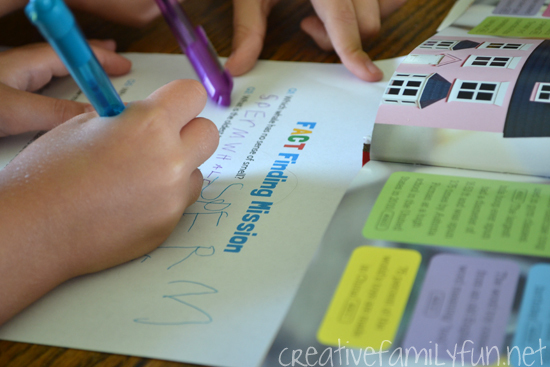 We used it to go on a Fact Finding Mission! Disclosure: We received a free copy of this book from Parragon Books, all opinions and the related activity are our own. This post also contains Amazon Affiliate links. Please see my disclosure for more details. 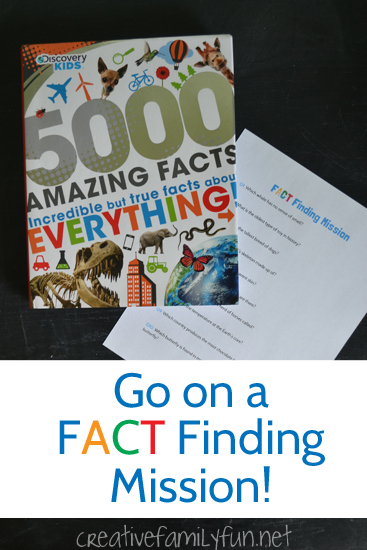 This fantastic book is called 5000 Amazing Facts: Incredible but True Facts About Everything by Discovery Kids. They’re not kidding. There are facts about everything such as dinosaurs, meerkats, black holes, populations, and world treasures, just to name a few. This is not a book that you have to read straight through. You can open it up to any page and enjoy. My 3rd grader thinks this is the most awesome book ever! Even though this book is so enjoyable on it’s own, I thought it would be a fun idea to play a little fact finding game. I leafed through the book and found 10 different facts that were interesting. (Finding only 10 was quite a challenge!) I then created questions for those facts and challenged the girls to figure out the answer. It seems like a daunting task to find the answer to only 10 questions from a book of 5000 facts, but I was very deliberate in my questions. The facts in the book are grouped together by topic and I made the topic very obvious in my question. For example, question 1 is “What whale has no sense of smell?” The girls were able to find that question on the whale page. The questions also went in book order, so they didn’t have to go back and forth in the book. My girls absolutely loved the game and learned so much from it – more than just some fun trivia facts. They learned to find the subject of the question so they could easily find the section of the book they needed. And, they learned how to find the answer to a question in a book. All good research skills they need to know. If you would like to use our Fact Finding Mission, you can grab it at the link below. I’ve even included the answers on a second sheet. It is very specific to this book. Get the Fact Finding Mission here. 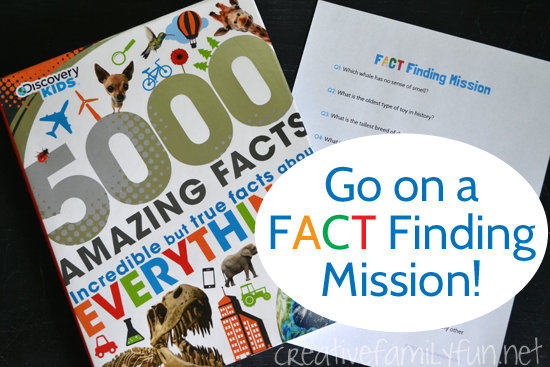 You can go on a fact finding mission with many nonfiction books. You just have to take the time to write out a few questions. 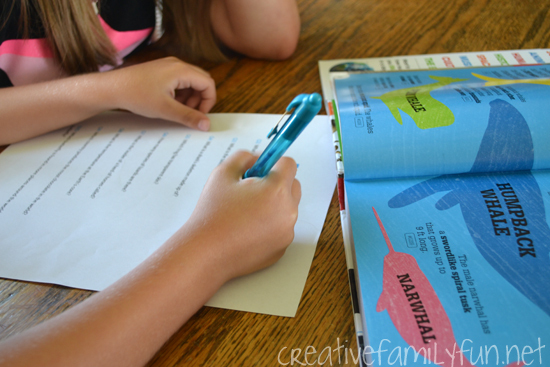 It’s a great way to help a kid explore a nonfiction book and helps them learn how to research and find the answer to a question. Thanks again to Parragon Books for 5000 Amazing Facts, Incredible but True Facts About Everything. You can click on the book link to purchase.